The stunning city of Prague is renowned for its archaic architecture, bountiful historic structures and unique buildings that if they could talk, would tell many stories about the vibrant and enigmatic past of Prague. 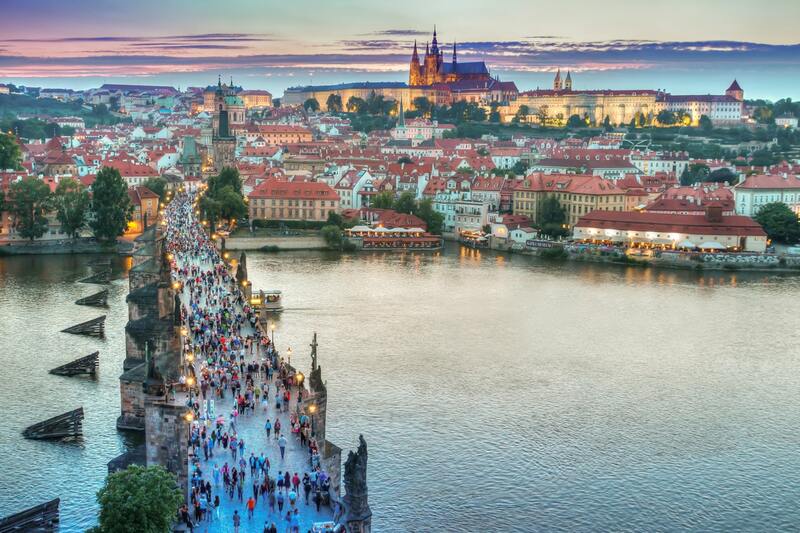 With that in mind, you may be surprised to discover that just 48 hours in the Czech capital will see you experiencing an abundance of cultural discoveries, incredible cuisine and plenty of history. What you may also be unaware of is that Prague has a fantastic selection of vegan-friendly restaurants. From traditional Czech dishes with a unique vegan twist, to some of the most beloved vegan dishes from all around the world; you’ll be spoilt for choice when spending 48 hours in Prague. Prague castle is renowned as the largest ancient castle in the world and dates all the way back to the 9th century. The castle itself is truly a phenomenal structure but make sure to check out the surrounding gardens for other hidden gems of beauty. Connecting the Old Centre of Prague to Mala Strana, Charles Bridge is a beloved piece of architecture in Prague. Climb your way to the top of one of the towers for unparalleled views of Prague city. The Old Town is an idyllic place to enjoy a beverage or two in one of the many quaint bars or restaurants. Be sure to pay attention to the Astronomical Clock when it chimes every hour. Prague is famous for its eclectic offerings of alcoholic beverages, so why not embrace the culture and take part in a pub crawl. There are many guided tours for you to enjoy, or you could simply make your own way around some of Prague’s most beloved pubs. Absolutely teeming with history, Prague is the perfect European city to embark upon a ghost tour of the Old Town. You’ll be treated to eerie stories of the city’s past, and you’ll learn many things about Prague that you didn’t previously know. Top of FormThe Pinkas Synagogue is the second oldest surviving synagogue in Prague. It features an incredibly heartfelt Holocaust memorial to over 80,000 Jewish victims. The experience at Pinkas Synagogue is sure to be an emotional one, but it’s definitely something you should see to pay your respects when in Prague. Prague is home to countless vegan eateries, and with just 48 hours to explore the city, it can be hard to narrow it down to just a few. Here are some of the most recommended vegan restaurants to try in Prague. From traditional Czech dishes, to more unique cuisines, there’s so much to try! Moment Café is a 100% vegan eatery offering a wide range of delectable vegan dishes including pancakes, sandwiches, burgers and a hearty selection of decadent cakes and treats. It’s definitely well worth a visit during a 48-hour stint in Prague. Serving a healthy selection of smoothies, soups and many vegetarian and vegan dishes, MyRaw is an idyllic haven located within a shopping centre for vegan fanatics! An incredibly popular chain restaurant in Prague, with four different restaurants throughout the city, Loving Hut serves a plentiful selection of yummy vegan dishes. From plenty of fresh fruit and vegetables to soups, salads and traditional Czech specialities, no trip to Prague is complete without a visit to a Loving Hut branch. Vegan’s Prague is one of the most beloved vegan restaurants in the city. Offering a wide range of dishes including stews, burgers and exquisite desserts, Vegan’s Prague is a divine vegan restaurant that must be visited during your stay. This vegetarian restaurant is also home to some of the most wonderful vegan dishes served in Prague. Choose from a range of pastas and burgers as well as numerous Mexican dishes all with a unique vegan twist. 48 hours in Prague may not seem like a sufficient amount of time to truly explore the city but you’d be pleasantly surprised at just how much you can fit into just two days. Make sure you tick off the most famous sights in Prague such as the Castle and the Old Town, and ensure you save plenty of room for trying out some of the best vegan dishes in the city! Most restaurants offer breakfast, lunch and dinner options, so plan your itinerary accordingly, so you can experience as much as possible during your time in Prague!